These are my nephews, Solon and Nathan. They visit me in Pennsylvania a few times a year and because their mother and I agree that outdoor time is quality time, we always take at least one hike when they come. 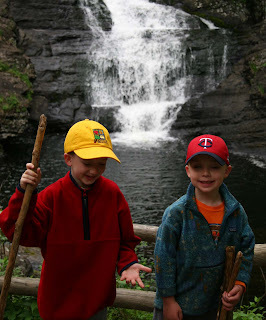 This time we went to Raymondskill Falls, not far from beautiful downtown Milford. Truth is, I have an ulterior motive on these walks. My goal is to get these two boys to eat one thing I pick from the trail. (If this doesn't sound like a challenge to you, try getting a 7-year old to switch from yellow to white American cheese, then get back to me.) Berries are the easiest because they're sweet and familiar. But this time the boys were brave enough to try some wild lettuce. I picked a few of the inner, tender leaves and passed them around, expecting full scale rebellion. In fact, they grudgingly admitted it didn't taste bad. Of course I know they were humoring me, but that's a sign of affection, right? I believe that if you start 'em young, there's a chance kids will remember the fun they had walking in the woods, picking berries, eating wild lettuce. Maybe some day, years from now, Solon or Nathan will be walking in the woods and say to his companion, "Hey, we can eat that!" THAT would make their Aunt Ellen very happy. Just checked out your book at the library and I'm in love! Awesome.